“It takes me a while to get to stuff” would be an appropriate opening for at least a dozen blog posts I could write. One of them has to do with getting on the ball about making my kids at home in the outdoors and also getting at home in the garden. 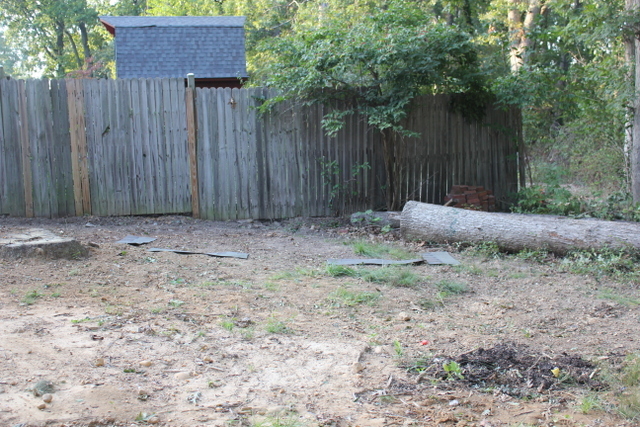 When we set out to renovate this house four years ago, it had no yard. 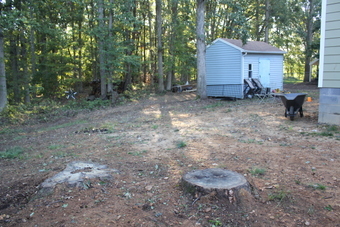 The Space Behind The House was just The Forest. Baby oaks were growing everywhere, and more sprouted up the following year a month or two after we had moved in. Out of steam– that is, money and energy – after early August when we moved in, we didn’t execute on a back deck right away. That is to say, our back door was boarded closed so no one would fall five feet down to rock- and debris-infested clay. Our now-garden spot wasn’t any better. 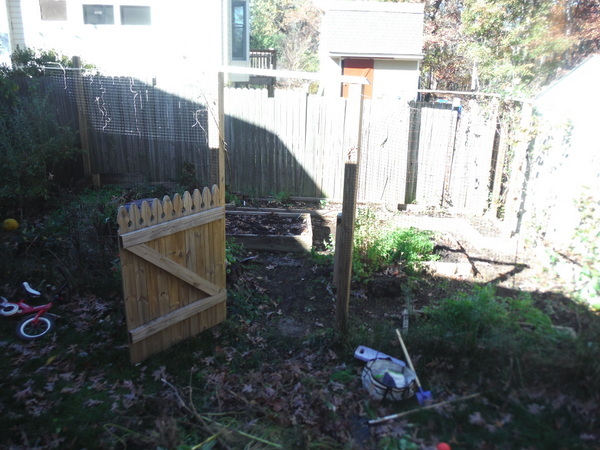 We had a shed to move out the middle of the yard, a new shed to install to the side of the yard, a deck and thus back egress to build, a garden to build and some kind of yard to fashion that would let us at least play soccer. That all took a while. We moved in August 2012. We got a new shed installed in November or December that year. We dumped a bunch of mulch on one part of the yard around the same time. The shed got taken down – after we finally found someone who said he would do it for free and then actually came to do it – in March 2013. We finished picking up tiny pieces of blue vinyl siding out of the ground never. We had a deck built and a garden built in 2013. We decided playing soccer on mulch was only so good and that, if we didn’t landscape the front, we could be okay with planting grass in the back. We prepared the back yard for seeding. Previous to this time, more and more trash and broken glass and nails surfaced every time it rained. We picked up tons of trash and pulled up weeds and baby trees and then seeded with grass in fall 2013. We watered and stayed off it all fall but had some grass by winter. 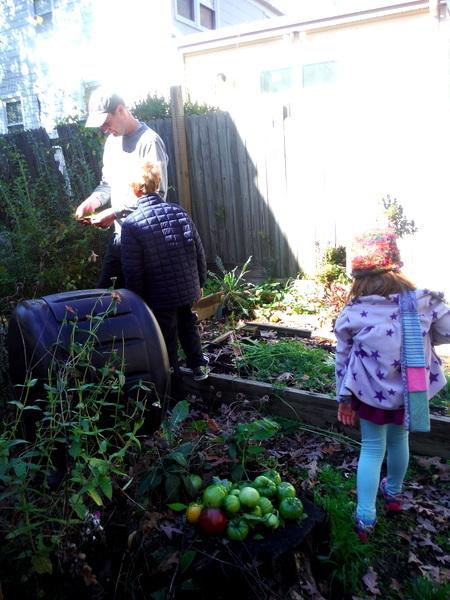 Spring 2014 – I could finally say “go play outside” to my children, then 8 and 3. So it was a long time that my kids didn’t feel at home in their yard. This is something I regret quite a lot, but I think that 18 months of mostly-indoor living may finally be wearing off. 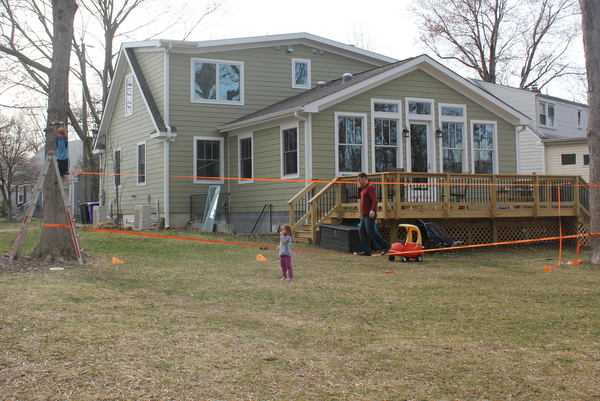 In spring 2014, we got a Slacker rope and a zip line, which my husband got up in time for my son’s unseasonably warm birthday party in late March. The kids spent a lot of time at the part digging in the “hill,” a mound of dirt we’d had moved to our back yard when the driveway was dug. I had wanted it for dramatic play, a quaint little bit of topography, but it missed getting seeded with grass so continued to be sort of a weed-strewn eyesore until this fall when it was seeded, and so now looks more like a grassy knoll. At the time of our first spring utilizing the yard, though, I was pleased as punch they the kids were out there playing. Digging in the dirt was awesome! Earlier this week, after my garden expert friend confirmed that dying sweet potato vines meant that the roots were ready to harvest, I went straight there after the kids got off the bus. My son followed and daughter joined. 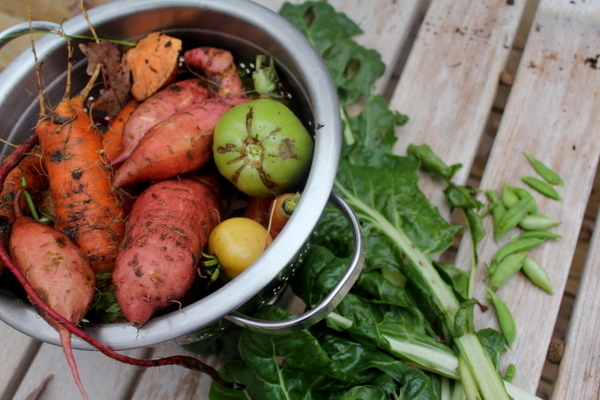 It was sprinkling, but we were so excited by all the potatoes and carrots we dug up. And there were a dozen peas. I picked chives and parsley that then went into (regular) potato pancakes, which the kids loved. I made a soup with the carrots and some other sweet potatoes. It was delicious. My son couldn’t stop exclaiming about the sweet potato harvest! Yesterday we cleared out the garden. Everyone helped. There were about two dozen green tomatoes. 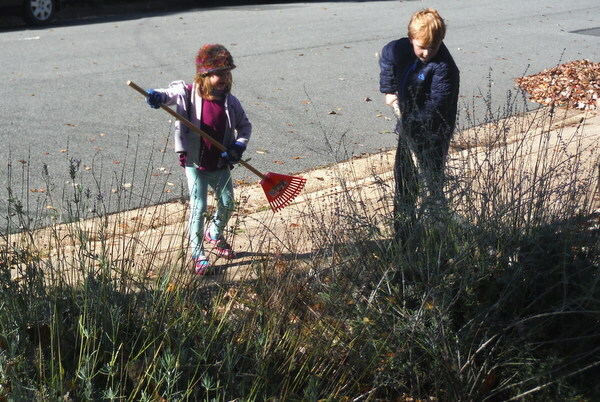 The kids raked. And played. We have no fort or tree house, no play structure or swing. 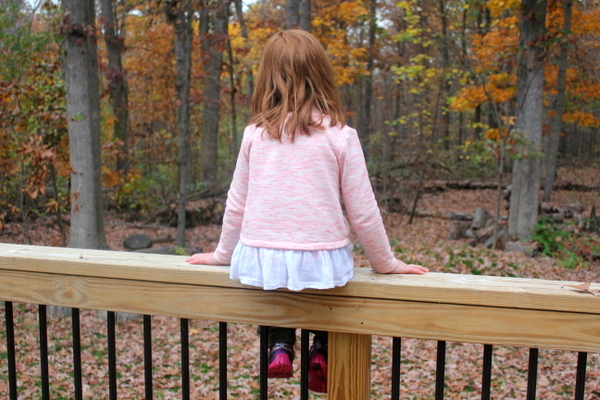 It has taken more than three years of living here – and, let’s face it, of growing up – for my kids to be able to play safely outside and to not whine about coming in after eight minutes. We still have not become the family that goes on hikes every weekend or that has camped more times than we have fingers on one hand. But there have been some great moments of late. Read the full renovation story here.